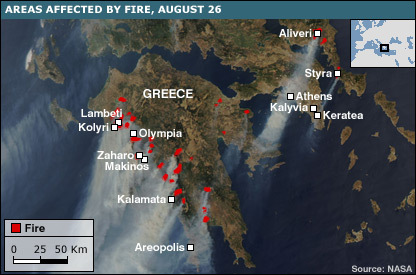 Fires rage across southern Greece, klling 60+ and we find ourselves consuming the ultimate reality show, a gory game show where the score is measured in lives lost and acres burnt. Three days later and not much besides the mercy of the winds have changed. Cries of terrorism, Greece’s Sept11, Greek flags on TV screen top left corners. Then, more Bushisms, PM Karamanlis , standing in front of a Canadair firefighting plane, borrows some tactics from Bush, speaking to troops and firefighters, “the coalition of the willing”, Firefighters coming from across the EU, Russia and others. One thing missing : The “mission accomplished” sign abve his head. I ask myself what the mission is, helping those poor people or getting re-elected. I’m confused but will not allow myself to be terrorised. Not again. 16 days to Elections: Watch the circus.